DASTAK- Singapore’s only Hindi Theatre Festival is coming back for the third year, after a hugely successful debut in Nov 2016 and subsequently 2017 – all of which were sold out shows. The format remains the same as last year i.e. 10 Hindi short plays, written by 10 playwrights and directed by 10 directors, showcased back-to-back in each show. The festival will see both new/original scripts as well as Indian classics. DASTAK this year is bigger – not just in the number of shows but in overall canvas. It started with DASTAK Writers Workshop in February that provided a platform to understand the nuances of writing scripts for stage and in required format and framework. This was followed by Actors workshop for aspiring actors. We also conducted a panel discussion in October on Theatre- Evolution, Creativity and the way forward with stalwarts from Singapore Theatre including Haresh Sharma ( playwright) , Alfian Sa’at (playwright) , Nelson Chia ( actor-Director) , Zelda Tatiana ( actor - Director) that was conducted by well-known stand up comedian and actor/director Sharul Channa. Coming up next, ahead of the Festival is an actor’s experience sharing session with Singapore’s leading theatre actress- Siti Khalija scheduled for November 2018. From DASTAK plays’ perspective Classics this year include stories of Anton Chekov, E.V Lucas and Shivani (India). Original scripts have come from writers from all over the world, including writers based in Singapore & India. DASTAK’s aim is to showcase talent and offer local audiences a variety in theatre. “We aim to make the Singapore theatre landscape as diverse as its social fabric. The true success of this event is in unravelling new local artists in performing arts streams - artists who are potentially of International calibre and who will attract global attention to Singapore’s growing theatre industry,” Shalaka Ranadive, festival director of DASTAK said. 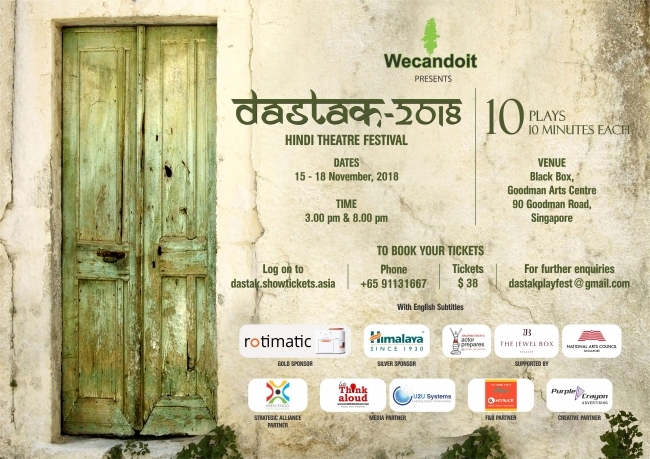 In line with Singapore’s multi-racial ethos, DASTAK’s intent is to showcase talent via Hindi theatre but not limited to Hindi-speaking audiences, and the way it aims to deliver on this promise is by having English surtitles for all the plays across all shows, with the hope of furthering cultural integration between India and Singapore. Theatre as an art form transcends boundaries. As witnessed last year, DASTAK actors went on to doing multiple productions with local artists and a number of well-known local artists have come on board as directors of DASTAK this year. They are Saleem Hadi, Sharda Harrison, Rishi Budhrani, Sharul Channa and Musa Fazal. A suspense story that has at its core the theme of women's empowerment. A couple are kidnapped and the Kidnapper threatens to kill the male who is thought to be an army officer who he believes killed his family in an encounter. A case of mistaken identity, gender role reversal and a welcome twist at the end. 3. Sati - is based on a Hindi classic by celebrated author Shivani. It highlights out fated rituals and customs and how a trickster fools a group of women in a train journey. Directed by local stand up comedienne Sharul Channa. This will be the third time that she will be directing for Dastak. 8. Astitva -Local Singaporean actors and physical theatre practitioner Sharda Harrison puts together a devised movement theatre which deals with the issue of body image and how popular culture forced women to conform to certain stereotypes. Performed as a movement piece with HIndi dialogue with an ensemble of 7 women, among them are Singaporean, Malaysian, Indian and Pakistani ethnicity. 9. Guru Gud Chela Cheeni- Bollywood is a concept that really bonds the South East Asian community and Singaporeans, even if they don't understand Hindi. Chulbul Pandey is a laugh a minute farce based on popular Bollywood film characters. 10. Ek Din Bank Mein (Translated -Day in the Bank) comes from a very well-known respected theatre group in India- ANK Theatre. It is a dramatization of a classic story by Anton Chekov and directed by veteran actor/director Preeta Mathur from India. The play is a comedy of errors and is set in bank, where the protagonist is troubling the bank manager with irrelevant questions and how the bank manager tries get away without being too rude to the customer. There will be total 6 shows from 15th to 18th November at the blackbox at Goodman art centre. There will be 2 matinee shows on 17th and 18th November and 4 evening shows on all 4 days. An invited GOH will open the show. All 10 plays will be staged back to back on all days. The audience after the show get to vote for the best play. On the last day we announce the best play on the basis of the votes. 2 Theatre personalities are invited to judge for the best Actor and best director. Wecandoit was set up in 2009 in Singapore. As founder of the company, Shalaka Karnik Ranadive brings to the company a wealth of experience ranging over 20 years. The objective of Wecandoit is to tap and encourage the local creative talents (actors, directors, playwrights, students and adults, music composers, set designers, sound and light designers) who are passionate about performing arts. Wecandoit creates a platform to showcase these talents. Till date Wecandoit has staged about 20 such productions including Dastak – Hindi Theatre festival. The stage is a powerful medium that can entertain, provoke thoughts and convey messages. Wecandoit also conducts workshops for actors (children and adults) in acting, directing and playwriting. Shalaka moved to Singapore in 2007, bringing with her over 25 years of solid Theatre, TV and Film experience across three countries. With the help of a few genuine friends (as it always happens), she set up Wecandoit Productions – a name that was inspired by President Obama’s then campaign slogan, Yes We can. Unsurprisingly, her first two theatre productions were in Hindi – “Coming soon” and “Dia”. She then went on to stage over 15 productions in her over 9 years here, most of which were not just well-received, but critically acclaimed as well. One of them was her play “Rojak” which gave an insight into migrant workers and their lives in Singapore. It was a sold out production. In 2014, she directed a children’s musical, ‘Nikki’s world’ with an ensemble cast of over 50 artists, and ‘Dhaara’ which she directed for the Samarpana Festival 2014, in Singapore and India. She also directed a Tamil play for Pathey Nimidam in 2017. She recently acted in a Hindi play, ‘Gudiya Ghar’, directed by Sharul Channa. She is also the Singapore representative for Anupam Kher’s acting academy, ‘Actor Prepares’; to-date the academy has trained over 100 actors here in Singapore. Actor Prepares is also ready to launch its next batch from Feb 2019 onwards. With DASTAK, Shalaka is aiming to bring Hindi Theatre to the fore. DASTAK is a knock of opportunity for artists in Singapore; it is a knock of Hindi theatre on Singapore’s theatre doorsteps and a beginning of many more wonderful things to come.